Constant sea breezes cool Barbados's balmy, tropical climate but the island is still sunnier and drier than the other islands. During the so-called wet season (July to November), some brief rain showers are likely. Average sunshine hours per day are eight to 10 from November to March and eight to nine from April to October. Tropical storms and hurricanes may occur between June and November. Lightweight cottons are advised; beachwear is not worn in towns. 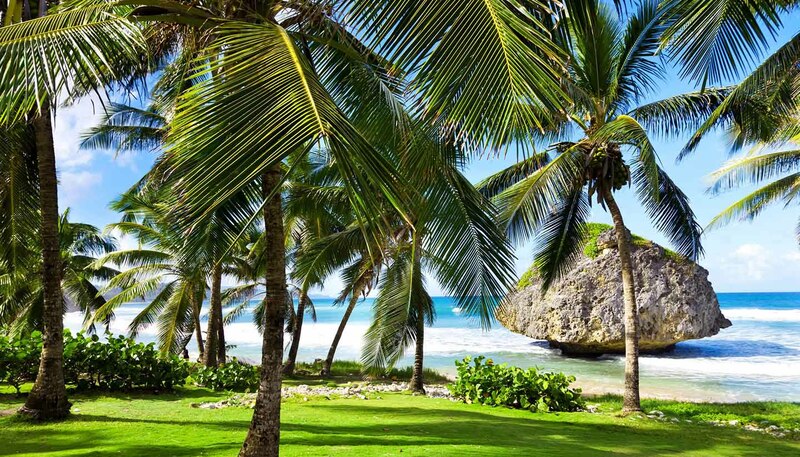 As the most easterly of the Caribbean chain, Barbados lies well to the east of the West Indies. A lively surf scene enjoys pounding waves along the rugged east coast where a rocky shoreline kicks up plenty of spray. To the west, fine white sand beaches and natural coral reefs predominate. A handful of gently rolling hills form a ripple to the north while the rest of the island is predominantly flat. Coral filters ensure surrounding waters are among the purest on the planet.